Alternate approaches for the simulation of the same quality property are included, to allow users to select the most suitable for specific modelling studies. The component is used within the WARM 2 application. RiceQuality is distributed free of charge for non-commercial purposes with a dedicated software development kit (SDK), and can be used by modellers and developers in their own applications. SDK includes documentation of code and algorithms, as well as sample projects showing how to use the component and how to link it with others for, e.g., crop growth and development. Cappelli, G., Bregaglio, S., Romani, M., Feccia, S., Confalonieri, R., 2014. 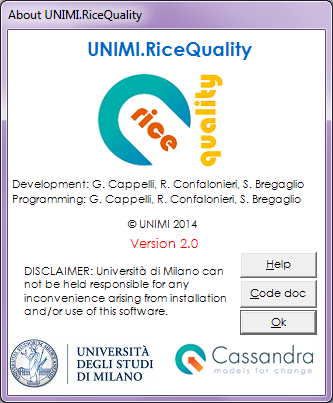 A software component implementing a library of models for the simulation of pre-harvest rice grain quality. Comput. Electron. Agr. 104, 18-24.